Four 10 foot wall timelines dating from 5000BC - the Present - $17.95 each. Timelines are printed on sturdy, heavyweight 32lb paper for durability. Click here for a zoomed in view of the Ancient and Medieval timelines! 5000BC - 400AD 10x1 ft. banner wall Timelines of World History by Knowledge Quest. Date increments remain consistent on each timeline, giving a truer perspective of history. Over 125 timeline category stickers included. 400 - 1600AD 10x1 ft. banner wall Timelines of World History by Knowledge Quest. Date increments remain consistent on each timeline, giving a truer perspective of history. Over 125 timeline category stickers included. 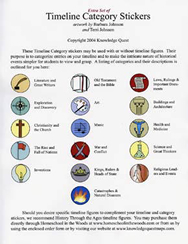 1600 - 1850 10x1 ft. banner wall Timelines of World History by Knowledge Quest. Date increments remain consistent on each timeline, giving a truer perspective of history. Over 125 timeline category stickers included. 1850 - the Present 10x1 ft. banner wall Timelines of World History by Knowledge Quest. Date increments remain consistent on each timeline, giving a truer perspective of history. Over 125 timeline category stickers included. Buy all four and Save $14.80! It is a proven fact that completing timelines help cement historical facts for students and adults alike. A timeline can become the compilation of a student's learning. Seeing the progression of time in the form of a timeline will allow your student to gain a better understanding of the flow of history. The truth is... many students may study the fall of Constantinople to the Ottoman Turks, the end of Hundred Years' War between France and Britain, and the printing of the first book, the Gutenberg Bible, never realizing that these three events all happened within the same year - 1453AD. These events are seemingly unrelated and yet the use of a timeline can unlock the mystery as to why all of these events occurred within the same year. A timeline will give your student a unique perspective of time. By seeing the events of history recorded in linear progression, your students will make connections between those events in history that they might not otherwise make. Note: Actual size of stickers is approximately 1 inch in diameter. There is a slight color variation from screen images above to actual printed stickers.